Bracklesham Youth under-nines have won the Cissbury Cup. It was their second cup competition and after topping their group table, they had a final against Worthing Dynamos White. A 2-2 draw ensued, with both goals scored by Joshua Craven. In extra-time no further goals were scored. 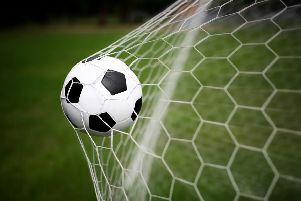 In the penalty shootout it was 2-2 after five penalties apiece and a tense sudden-death shootout went on for five rounds before a save from Sam Doherty and a goal from Rio Nice won it for Bracklesham. Manager Craig Stevenson and assistant coach Fred Thompson were proud of their players. * Felpham Colts’ under-nines won the Cathedral Cup at Palentine Park in Worthing, beating Chichester City Youth 3-0 on the final. The line-up was Isaac Glanfield, Lennie Smith, Deion Williams, Daniel Reeves, Jay Quin; front - Albie Scott, Joe Checkley, Louis Andrews, Karol Mucha. Selsey’s continued good form continued on a 3G pitch at Arun Leisure Centre. Ferring started the stronger side but John Jones was strong in goal and Sam Weaver marshalled the backline, with Rhys Hall, and Jamie Thomkins solid. Selsey settled and got the breakthrough with 15 minutes to go in the first half. Toby Blanshard won the ball and played in Rhys Grocott, who fed Luke Ayling in front of goal. He hit a fine shot into the top cornerto make it 1-0. A spell of possession for Ferring saw a couple of chances created and they levelled when the ball broke on the edge of the box for a midfielder to strike a fine shot into the top corner. Grocott picked up a through-ball and ran through with Ryan Hains, who nicked it off his toe to slot past a static keeper and make it 2-1. Ferring came out with gusto but excellent work in midfield by Jensen Carurthers and Ewan Lennox coupled with a last-minute defensive clearance from Rhys Hall, ensured it stayed 2-1. Josh Jones hit a long clearance and Hains capped a fine performance by controlling the ball with his first touch using his pace to beat two players then power past the last defender and slot in past an advancing keeper. This was a fine performance by all the team with Toby Blanshard and Hains made joint men of the match. Josh McCulloch made early saves as Lancing made some dangerous attempts on goal. City settled and started to press Lancing. The breakthrough came with a cross into the box from Teddy Phillippo converted by Ashley Gillett for the first goal. Some well-structured passing between Jacob Taylor, Gillett and Harry Angell gave Chi some great chances but Lancing equalised. City were hungry for a win to keep the pressure on at the top of the table. Some great moves down the left between Max Hopp and Ben Roberts kept the crosses firing in, while George Purvis was enterprising in midfield. A goal-kick from Lancing landed at Angell’s feet but he failed to find the back of the net, but he soon made up for it by making it 2-1. Great passing between Angell and Gillett led to Guillett’s shot finding its way into the net for 3-1. Lancing scored on the break before Angell netted his second of the game. The win put City second in the table.